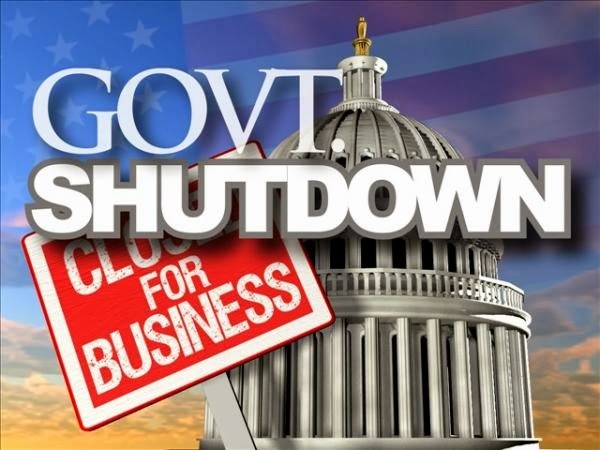 The U.S. government began a partial shutdown on Tuesday for the first time in 17 years, potentially putting up to 1 million workers on unpaid leave, closing national parks and stalling medical research projects. If Congress can agree to a new funding bill soon, the shutdown could last days rather than weeks. But no signs emerged of a strategy to bring the parties together. The political dysfunction at the Capitol also raised fresh concerns about whether Congress can meet a crucial mid-October deadline to raise the government's $16.7 trillion debt ceiling. With an eye on the 2014 congressional elections, both parties tried to deflect responsibility for the shutdown. President Barack Obama accused Republicans of being too beholden to Tea Party conservatives in the House of Representatives and said the shutdown could threaten the economic recovery. The political stakes are particularly high for Republicans, who are trying to regain control of the Senate next year. Polls show they are more likely to be blamed for the shutdown, as they were during the last shutdown in 1996. "Somebody is going to win and somebody is going to lose," said pollster Peter Brown of the Quinnipiac University poll. "Going in, Obama and the Democrats have a little edge." The dollar held steady on Tuesday even though much of the U.S. government was due to start shutting down. S&P stock futures inched up 0.2 percent, unchanged from earlier price action after the cash index fell 0.6 percent on Monday, while U.S. Treasury futures slipped 5 ticks. Most Asian markets were trading higher on Tuesday. The shutdown, the culmination of three years of divided government and growing political polarization, was spearheaded by Tea Party conservatives united in their opposition to Obama, their distaste for Obama's healthcare law and their campaign pledges to rein in government spending. Obama refused to negotiate over the demands and warned a shutdown could "throw a wrench into the gears of our economy." 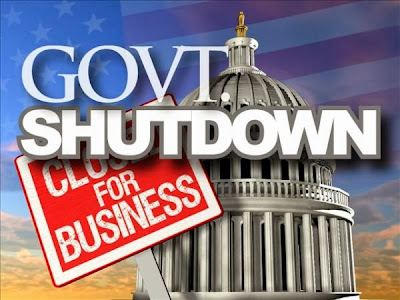 Some government offices and national parks will be shuttered, but spending for essential functions related to national security and public safety will continue, including pay for U.S. military troops. "It's not shocking there is a shutdown, the shock is that it hasn't happened before this," said Republican strategist John Feehery, a former Capitol Hill aide. "We have a divided government with such diametrically opposed views, we need a crisis to get any kind of results." In the hours leading up to the deadline, the Democratic-controlled Senate repeatedly stripped measures passed by the House that tied temporary funding for government operations to delaying or scaling back the healthcare overhaul known as Obamacare. The Senate instead insisted on funding the government through November 15 without special conditions. Whether the shutdown represents another bump in the road for a Congress increasingly plagued by dysfunction or is a sign of a more alarming breakdown in the political process could be determined by the reaction among voters and on Wall Street. "The key to this is not what happens in Washington. The key is what happens out in the real world," said Democratic strategist Chris Kofinis. "When Joe Public starts rebelling, and the financial markets start melting down, then we'll see what these guys do." A Reuters/Ipsos poll showed about one-quarter of Americans would blame Republicans for a shutdown, 14 percent would blame Obama and 5 percent would blame Democrats in Congress, while 44 percent said everyone would be to blame. After Boehner made his appeal, House Democratic Whip Steny Hoyer called on him to permit a vote on a simple extension of federal funding of the government without any Obamacare add-on. "I dare you to do that," Hoyer roared. The potential fallout has some Republican Party leaders worried ahead of the 2014 mid-term elections and the 2016 presidential race, particularly given the Republican divisions over the shutdown. Republican Senator Ted Cruz of Texas, who commandeered the Senate floor for 21 hours last week to stoke the confrontation and urge House colleagues to join him, sparked a feud with fellow Republicans who disagreed with the shutdown and accused the potential 2016 presidential candidate of grandstanding. "Whether or not we're responsible for it, we're going to get blamed for it," King told reporters on Monday. "They've locked themselves into a situation, a dead-end that Ted Cruz created." It was unclear how long the shutdown would last and there was no clear plan to break the impasse. The Senate on Tuesday planned to recess until 9:30 a.m., at which time Democrats expect to formally reject the House of Representatives' latest offer for funding the government. The shutdown will continue until Congress resolves its differences, which could be days or months. But the conflict could spill over into the more crucial dispute over raising the federal government's borrowing authority. A failure to raise the $16.7 trillion debt ceiling would force the country to default on its obligations, dealing a potentially painful blow to the economy and sending shockwaves around global markets. Some analysts said a brief government shutdown - and a resulting backlash against lawmakers - could cool Republican demands for a showdown over the debt limit. "A lot of this is political theater. It's not about real policy. Part of this is taking a stand for their constituents," said Julian Zelizer, a historian at Princeton University. "If there is fallout from a shutdown and there is a big enough shock, maybe they will be willing to move on to other issues," he said. Obama says negotiating over the demands would only encourage future confrontations, and Democrats are wary of passing a short-term funding bill that would push the confrontation too close to the deadline for raising the debt ceiling. "The bottom line is very simple - you negotiate on this, they will up the ante for the debt ceiling," Democratic Senator Chuck Schumer said.